In a structural biology first, University of Auckland investigators Ehab Jirgis, Drs Ghader Bashiri, Esther Bulloch and Jodie Johnston, and Distinguished Professor Edward Baker have determined the crystal structures of the MenD enzyme during each stage of its catalytic cycle. The enzyme is an important TB drug target and essential to the biosynthesis of menaquinone in Mycobacterium tuberculosis. 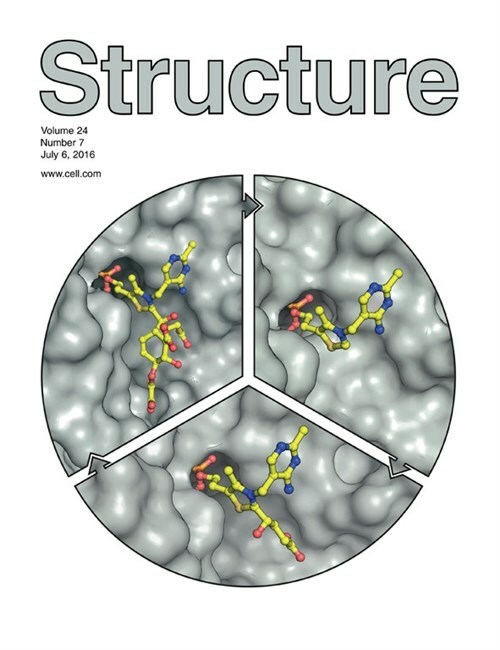 The research was published in the July 6 edition of the Cell Press journal Structure, along with a coveted cover figure. The work detailed in the paper was funded by Professor Baker’s Health Research Council (HRC) and Ministry of Business Innovation and Employment (MBIE) grants and is being continued within the TB Flagship program of the Maurice Wilkins Centre. On the cover: Thiamin diphosphate (ThDP)-dependent enzymes perform crucial C–C bond forming and breaking reactions. Catalysis passes through a sequence of covalent ThDP-bound intermediates whose structures have mostly remained elusive. Jirgis et al. (pp. 1167–1177) present structural snapshots, clockwise from the top right of the cover, of key steps in the catalytic cycle of MenD, an essential ThDP-dependent enzyme involved in menaquinone biosynthesis. Using NMR, Jirgis et al. tracked the formation of the unstable second substrate isochorismate, then trapped each reaction intermediate crystallographically as the substrates α-ketoglutarate and isochorismate were successively added to the enzyme-bound cofactor. Cover illustration prepared by Ghader Bashiri and Vivian Ward. Thumbnail image L-R: Dr Ghader Bashiri, Dr Jodie Johnston, Mr Ehab Jirgis.